If you ask anyone in the photo industry what Manfrotto is best known for, they’d probably tell you their tripods. That isn’t to say at all that they make awful bags though. Earlier in the year, we saw a couple of new bags from the company–and amongst the ones that we’ve been testing for a while is the Shoulder Bag 30. The 30 is a camera bag that is obviously meant to be a shoulder bag, but also meant to be placed somewhere in the middle. As the numbers get larger, so do the bags. And even though we weren’t so sold on the 30 when we first got it in, we eventually warmed up to it. Now, we’re actually quite impressed with the way it works in real life. We stuffed the Canon 5D Mk II, Zeiss 135mm f2, Phottix Odin, Phottix Mitros+, Einstein E640, Vagabond Mini, and MacBook Pro 13 inch laptop into the bag with no issues at all. 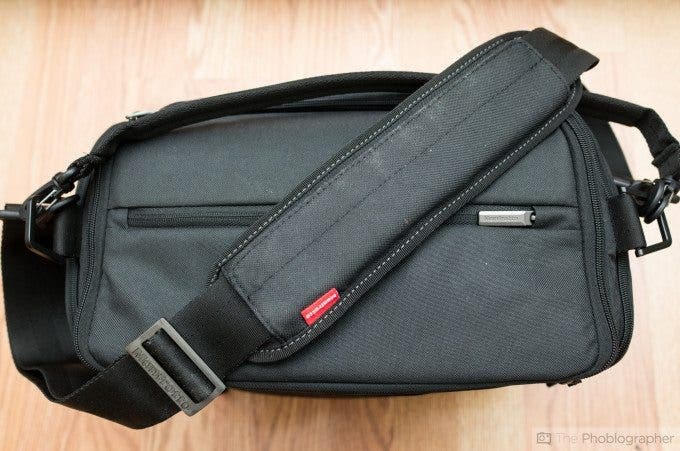 Manfrotto’s Shoulder Bag 30 is fairly inconspicuous; but if you really look at it, you’ll see a couple of red markings all over it. The only other red dot company in the market is Leica–and despite these bags having an emphasis on fashion, they’re not really focusing a lot on luxury features like an interior made of rare white gorilla. Instead, this bag is all about functionality. With that said, the front pad has a reinforced plastic shell inside to protect your gear from bumps and maintain shape. We’re going to cover what you want to see first: the inside. 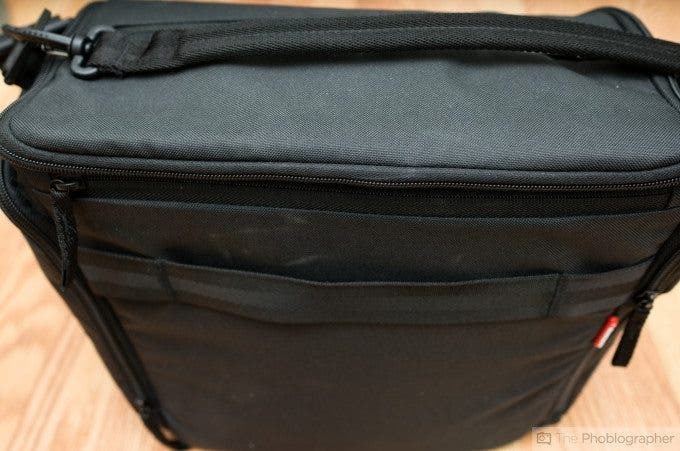 The bag has three dividers: two for the camera stuff and one for a laptop. Manfrotto’s new dividers also have red on them to signify that these are their new dividers designed to take more abuse and also keep a bag’s shape better. The padding is thick though not so thick so as to limit what you can store inside of the bag. The back of the bag is what will be against your body. Here is where you’ll find another strap and another thin pocket. This is an ideal place for storing something like documents or thin objects. 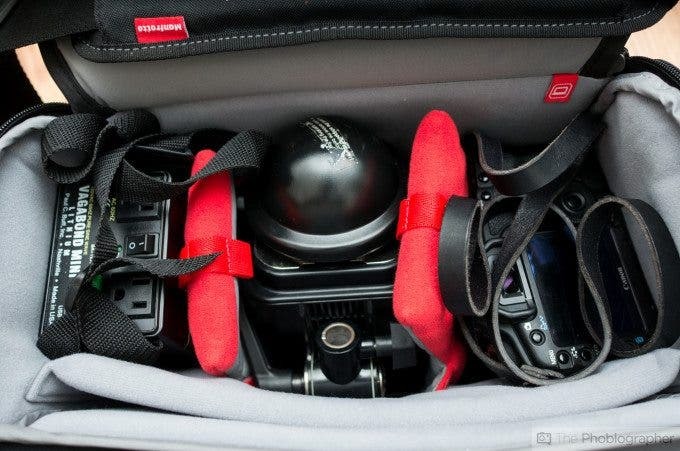 One of the side pockets has a lot of space inside to hold things like keys, phones, batteries or other accessories, Don’t even think about trying to stuff a hot shoe flash in here–it isn’t happening. There is a similar pocket on the other side of the bag which is meant to do the same thing. These pockets aren’t as tight as the offerings from ThinkTank. 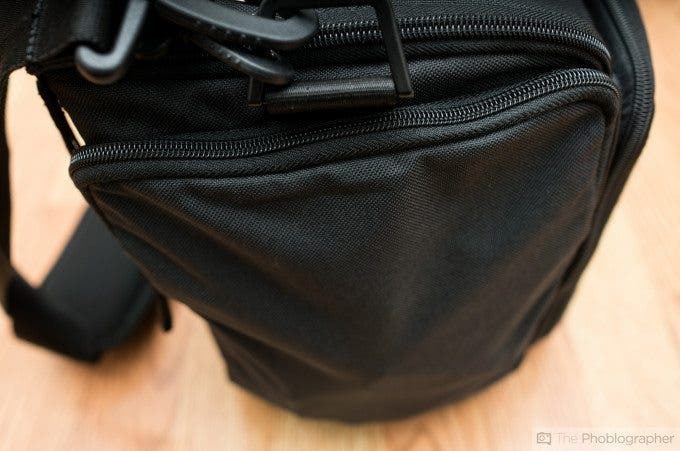 On top of the bag is a zipper that allows you to access your gear really quickly and directly–or at least it’s supposed to. In real life use, we found it a bit limiting and wish that it opened up more. You’re better off just accessing the main zipper. 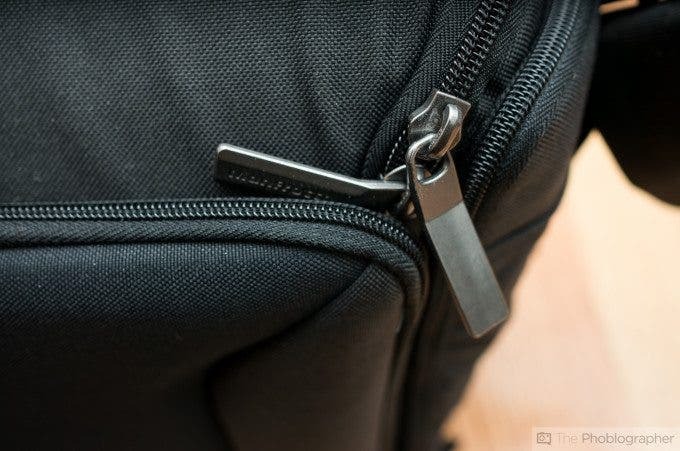 The main zipper runs along the entire top of the bag and one of the subtle touches put into the development of this bag is the zipper design. The zippers are slightly curved to conform to human fingers better. In the end, they really do work better and are a nice addition. Finally, we come back to the front pocket of the bag. 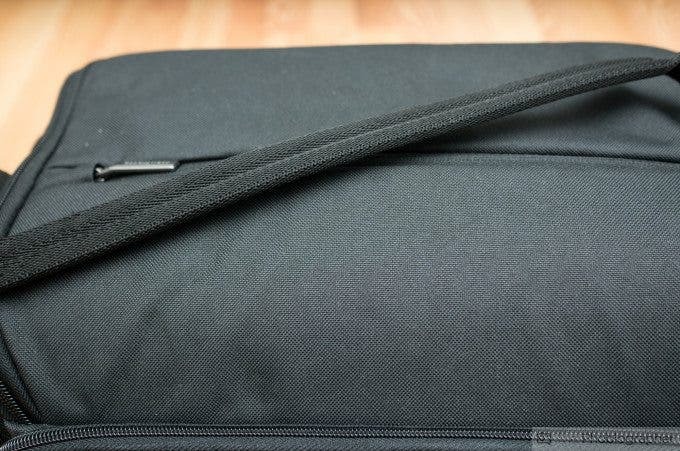 Here is where you’d probably want to store an iPad and/or pens and other documents. It’s weird for us to say that a camera bag is solid–so we’re not going to. Instead, it is more than adequate. Nothing about it feels cheap but instead quite thought out. This even includes the shoulder pad–which is super comfortable. Over the weeks of use, we did a typical “cram as much crap as we can” test on the bag. It comfortably fit multiple speedlights, a monolight, camera, cables, laptops, my iPad mini, and more. However, we really wish that it had a velcro option because a zipper can take longer to undo when it comes to accessing your gear. 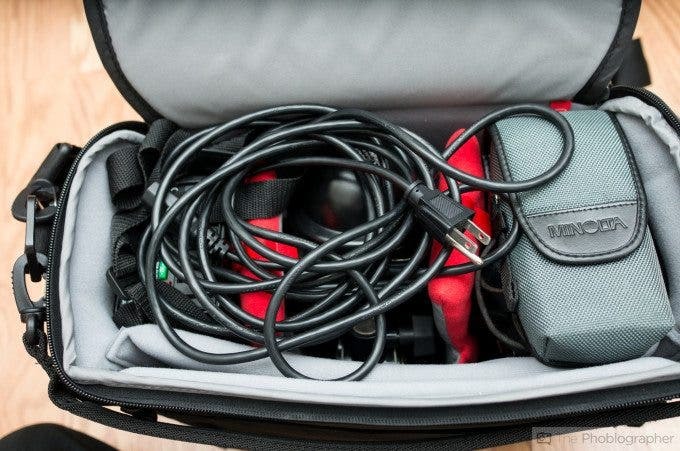 Because of this, we recommend it for the person that shoots landscapes, studio work, and anything else not requiring an urgency when it comes to accessing gear. 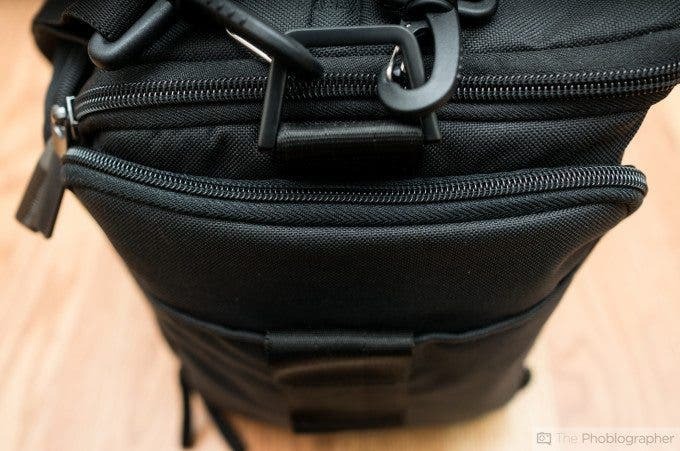 Overall, our only major problem with the bag is that it doesn’t allow us split-second access to our gear. Even with the attempt made with the top zipper shows that Manfrotto thought about it, but in the end it was just limited. 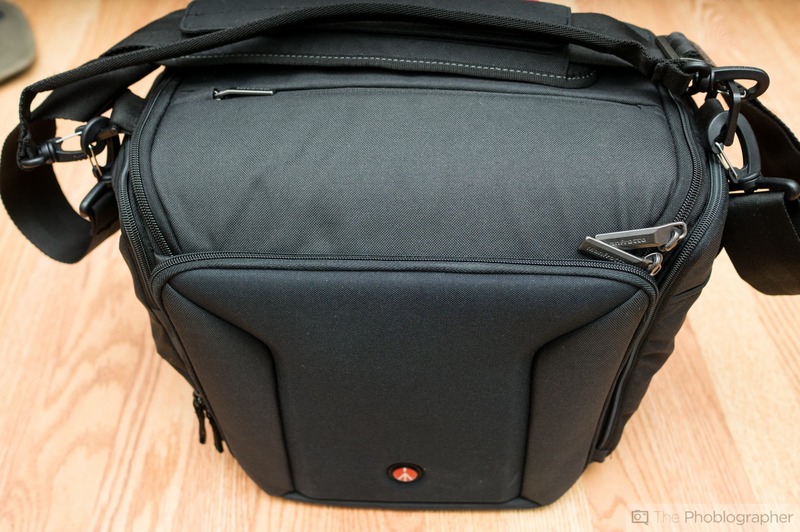 But if you’re not doing anything that requires quick access (like wedding or photojournalism work) then this is a fine bag that you’ll quickly fall in love with.